Ice Road Challenge times two! Today we make the return journey to Inuvik. Sunday was cloudy, so we were not able to fully recharge the solar car batteries. Monday was beautiful and Sunny, so batteries were completely charged around 6pm. At dinner, we made an impromptu decision to go out and have some fun. The plan was to have Jim ice ski – pulled along behind the solar car. Many of the guys from the camp came out to watch and the craziness. Fun over, solar car was down in battery charge and the sun was low on the horizon. So now, on Tuesday morning we are short of a full battery charge. Nevertheless, we will set off today. First order of business is to get everything ready. Jim and I pack the batteries with little hotties and the Styrofoam boxes for insulation against the arctic chill. Marcelo makes final preparations. Now, 11am, we stop by Mangilaluk School. Students are excited to see the car. After presentations in a few classrooms with Marcelo, the students gather outside to see the car take off from Tuk. We make a grand exit and then stop further down the road. We first have to wrap Marcelo’s feet up in blankets to prevent them from freezing in the draft at the front of the car. While stopped, one of the guys from Gruben’s drives up to tell us we forgot a tripod and a few other items at the camp. I leave Jim and Marcelo to drive the van back to pick up our stuff. It turns out they send someone up with our stuff and we miss each other mid-path. I get back to Jim and Marcelo. Jim and I get in the van ready to take off and notice the “check tire pressure” light. We step outside and Jim hears a hissing sound from the back tire. Panic! I must have hit something ugly on the gravel road. We leave Marcelo and race back to Gruben’s to have Earl change the tire. Spare tire in place we make a quick exit out of town and hit the ice road. It’s now 1:30 in the afternoon, and everything is a gray wash. The sky is gray and the endless snow and ice blend into the horizon. The camera hardly works because there isn’t much to focus on. Temperature for the day averages at 2? - much warmer than our trip on Saturday. Ice road conditions seem to be greatly affected by this increase in temperature. The pressure ridge exhibits more cracks. Melt water and overflow puddle around the pressure ridge and sometimes water even creeps onto the road. I try to take a picture of a crack in the pressure ridge. Jim says, “What are you taking a picture of – lots of white?” I start to be defensive to explain that it is a picture of the pressure ridge. Then I realize how ridiculous this is and laugh. “Yes, of course, that will be a picture of a bunch of white!” I was just hoping the crack would show. I was hoping to take a picture of something in this great sea of white. We meet some travelers on the road. A couple with skidoos. They are pull sledges with lots of supplies. They are dressed in beautiful cloaks with fur hoods. Throughout the afternoon, we will skip places with them several times – passing them and letting them catch up. They tell us of a place where we might see Caribou later in the day … we never do though. First big spinout and Marcelo is stopped facing Jim and I. We decide to pause for a break and recharge the batteries. The sun is starting to show. Waiting, we make a snow inukshuk (the symbol used for the winter Olympics). Solar power break turns into ice dance party. Jim pulls out his i-pod, we get out beach chairs and the solar car sign. We do some dancing out on the road. It feels like a party day at the beach. Except – we’re in the arctic. A few cars stop to check out our wheels. Down the road again. Winds pick up. Marcelo is feeling the wind. Jim and I are also feeling the wind in the support vehicle. It’s like this – mom always told you not to drive on ice and slush. Well, we’re doing exactly that plus contending with 20mph winds. Yikes! The van and trailer fishtail a few times. I’m happy not to be driving, but not exactly elated that Jim is driving. At one point, it looks like we are driving over a mud bar in the river. Under the ice looks to be dark brown dirt. The dark color has attracted the heat of the sun and the ice is melted through with big holes. This goes on for about ½ kilometer. Jim slows down to take a picture and I yell for him to Go, Go! - keep going – just keep going. Wowee! That is a bit scary. I don’t want to guess if we’re driving over mud or a hole in the ice road or what! Lots of sun and a beautiful evening. We stop to catch a few more rays on the car. It’s now very windy and we secure the solar car next to the trailer for protection. With time to kill, Jim decides we should get moving to make an igloo. He takes charge in showing us the proper way to cut snow blocks and stack them in a circle that tilts inwards towards the top. Two hours later, our igloo is half built. Inside it provides incredible protection from the perpetual wind. “But I have promises to keep, and miles to go before I sleep, and miles to go before I sleep.” So, we head down the road again. It’s now 9pm and we still have 130km to travel before reaching Inuvik. We decide to start making tracks. Daylight is still with us, so we take some pictures and do some filming. Day draws to night. It rained in Inuvik earlier in the day. This last stretch of the Mackenzie is all slushy. A few inches of slush sit on the road. Which sits on a few feet of ice. Which sits on a constantly flowing river. Shiver – that’s a lot of water to be driving over. Now it’s dark. For some reason, Marcelo’s lights are not working even though they were fully operational a few days ago. Marcelo decides to deal with the lights later. I switch with Jim to take over driving. I follow close behind the solar car to offer illumination from the van. It’s tricky business because the road is slick and I don’t want to get too close should the solar car spin out of control. Approaching Inuvik, Jim and I joke how we are “going south to get to Inuvik.” This is very ironic because Inuvik is so far north. Everything is relative. Just a few days ago, Inuvik felt like a small and remote outpost. Now it feels like we are returning to “the big city.” I feel privileged to have these experiences and to have seen so much over the past few weeks. Arrival back to Inuvik is cause for jubilation. Not too quick though. The solar car and van must get off the river. I step out to film their approach. They cross a big puddle several inches steep and continue up the icy dirt hill. The solar car zips up. Jim stops half way up to give me a lift. He makes a grand gesture of getting out of the van and kissing the earth. We laugh. We’re back safe after a fabulous adventure. Uh oh – the van is now stuck on the hill. It won’t start back up on the icy incline. Marcelo returns to help and we spend from 1:20 till almost 2am shoveling gravel under the van’s tires to give it traction. Up the hill at last, Jim points out that the big dipper and North Star are right in the middle of the sky. Arriving back to our hotel, Capital Suites, we get the car into the trailer and grab our bags. We look up and are rewarded with a most spectacular show of the northern lights. I feel it is a sign of good fortune for a successful ending to our expedition. Upstairs it’s soup and shower time. We collapse into bed for some rest. 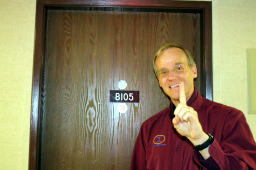 B104 was a happy place to be, so I was sad to leave my sleeping quarter at "out post mars. The trip to Tuktoyaktuk, ‘Tuk’ as called by the locals, has been a great experience on so many levels, from learning more about the local culture and its beautiful people, to having the privilege to stand, walk and drive on the frozen arctic ocean, to establishing life long lasting friendships. During our visit, I felt very connected to the land. Last night, we had a bit too much fun driving the solar car. I towed Jim on skis behind the solar car and went wild doing donuts on the ice. The car dropped from a complete charge down to about 85%. It was worth every single watt spent! I’m pretty certain that Jim became the first person in the world to ski on the frozen Arctic Ocean pulled by a solar car. It was a lot of fun, and for me, by far is one of the highlights of the project. We probably set a few world records along the way. The video footage is hilarious. Early in the morning, Jim and Lydia were busy readying XOF1 batteries and loading up the van and trailer. I was struggling with computer and internet connections. Finally outside, we rallied our new friends for one last photo op before leaving "outpost mars.' Then we head out to the local school for a presentation. At Ilisarvik Mangilaluk School, the kids were so excited. One of the teachers watched the live interview we did in Toronto on CTV Canada AM a few weeks ago and had her students learning about solar energy and the solar car. Yeah! They were thrilled with the arrival of the solar car. Jim (Mr. solar) has been teaching kids about solar energy for many years, his experience was a welcome addition to the presentation at the school with a strong message of sustainability and empowerment. With a cheerful “1, 2, 3, solar car” from the crowd, the XOF1 return journey on the ice road began. Just a few blocks later we departed from Inuvik. As we left, a call came on the radio We left a tripod back at outpost mars. Lydia set off to pick it up, but unknown to us, someone else was already on the way to bring it to us. Jim and I waited. Lydia arrived, ready to go….. hmm…not quite, the van had a flat tire. So, back to Outpost Mars to fix the tire. It just got replaced with the spare and we were back on the road. It is time for "on the road again!!!!!!" Ice road hold on to your cracks here comes the solar car! ....My biggest concern were the cracks on the ice, but this time we encountered other challenges - overcast skies, slush, melt water, strong winds and darkness. The weather wasn't looking very good as it was heavily overcast and everything was white … the road … the sky and in all directions white, white white until the horizon. If it wasn't for the snow bank one the side of the road we could easily get disoriented! About 60km from Tuk I had my first spin out - almost 180 degrees - and XOF1’s tail was now pointing in the direction of the sun. Hmmmmmm, the sun was almost coming out from behind the clouds so we took the opportunity for some charging. While XOF1 was charging from diffuse light, Jim got some music going and it didn't take long before the party started. Everyone was dancing on the ice, running and sliding. Jim and Lydia built an Inukshuk out of snow. We took the opportunity for some great fun with the car on the ice road and after two hours passed by quickly; we were again back on the road. The sky broke clear with the low angle Arctic sun beaming down on us. But ahead were the clouds. While driving the car, it was difficult to tell which direction the clouds were moving. We stopped to take advantage of the direct sunlight to charge the batteries. Minutes later, Jim got us busy building an igloo with improvised tools and parts of the solar car. Clouds were coming and going occasionally and blocking the sun. A few hours later, there were dark clouds on the horizon and as it was getting late, so it was time for "on the road again". Dark clouds ahead quickly darkened the sky above and I saw a few drops of rain. Yes, rain! - hard to believe, no? As we entered the east branch of the Mackenzie from the Arctic Ocean, strong head winds blew snow on the road. The Ice Challenge as I had expected was finally happening. XOF1 took on the strong head winds really well. I later learned from Jim that the van and trailer were sliding and being shaken by the winds. As temperature averaged 2?C, melt water and slush became the biggest challenge. I got much better at maneuvering around the ice cracks. That meant I was zig zagging to avoid being parallel to the cracks. In many instances, it was simply impossible to avoid and at other times, I just couldn't see the snow covered cracks. I experienced three hard hits where I thought I was going to get a flat for sure, but instead got lucky with no flat tires. Before we left Toronto, everything was in working order but now, for some reason XOF1’s head lights weren't working. As it got dark it became nearly impossible to see the cracks on the ice or the slush ahead. By the time we arrived in Inuvik at 1:20am the wind had died down considerably and it was pitch black dark. The exit ramp from the ice road was a big puddle of water. Lydia jumped out of the van to capture XOF1 crossing to the shore. I accelerated as fast as I could without spinning out of controll, crossed the water, and climbed the riverbank to the street. I continued driving back to the hotel. I didn’t notice the support vehicle behind, so I pulled over and got out of XOF1. No sign of Jim or Lydia, so I got back in the car and drove back to the exit ramp to find the van stuck half way up the exit. It got stuck when Jim stopped to pick up Lydia. Jim a very experienced Alaskan, quickly start to haul gravel with the small shovel we had and placed it under the rear wheel for traction. Thinking I’d have more luck, I gave it a try but didn't make much progress. Thanks to Jim's experience, resourcefulness, and brute force to make many trips with shovels full of gravel, the van finally made it up the hill. We arrived at Capital Suites at 01:50am, greeted by the magical site of the Northern lights dancing on the sky above us. We felt honored by the skies. Early in the morning it was a tease before hidding behind clouds. Break from normal lessons to learn about solar energy, yay! One, two, three, SOLAR CAR! Grey sky, grey snow, grey ice – here’s a little color for the camera to focus on! Beware those cracks in the ice, Yikes! Hello bright sun – give us some energy! There’s our favorite solar car! Yep, are we having fun yet? Hey Marcelo – ready to close the top yet? A little gravel goes a long way!